It all started when Brian and I were both stung in the barn in one week. Upon closer observation it was determined there was a large colony of ‘something’ living in our loft. Our first guess was bees because of a stinger left behind by Brian’s attacker. 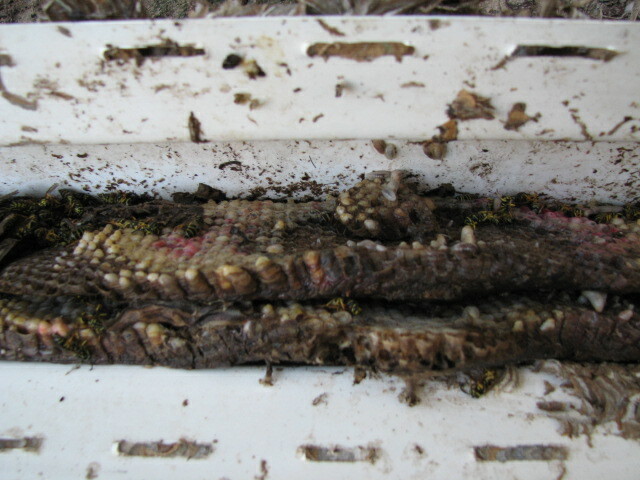 After consulting with a friend it was guessed they were not bees but yellow jackets – a type of wasp that also leaves behind a stinger and are much more aggressive than bees. The barn loft was too close for our comfort so it was decided these visitors had to go for the safety of everything else in the barn – including us! A bee keeping friend tipped us off that soapy water killed them just as effectively as a commercial spray, so we filled two pump sprayers and waited for dark. 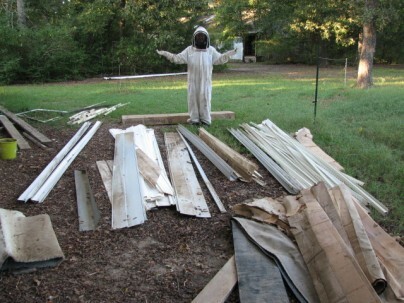 We had just been given a bee suit and a neighbor let us borrow another one. 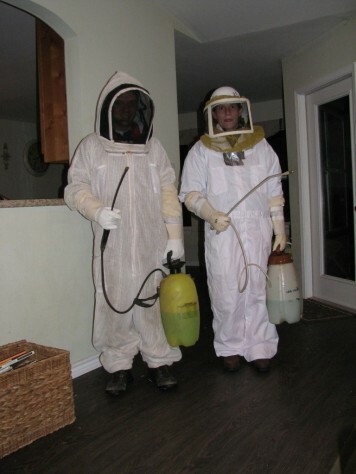 Unsure of how the suit would work with something other than bees, we donned thick protective clothing under the suits as well – I wore ski pants and jacket – we were taking no chances! A peek into their hole showed everyone at home and resting, though they started crawling around due to our lights. We knew once disturbed, the battle would be on! 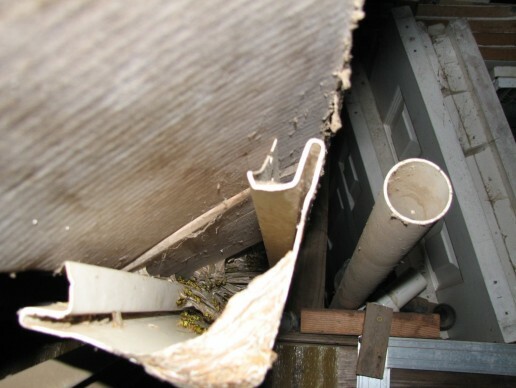 Brian started by sloshing several cups of soapy water up the siding that housed their nest. The first wave of guards angrily buzzed out and for several tense minutes we felt them hit our suits and wondered if our protection would be enough. I kept a steady spray going while trying to keep a steady nerve at the constant onslaught of the yellow jackets. I felt imaginary pinpricks all over my body but it was probably just the sweat produced by my ski suit. No stings – so far, so good. 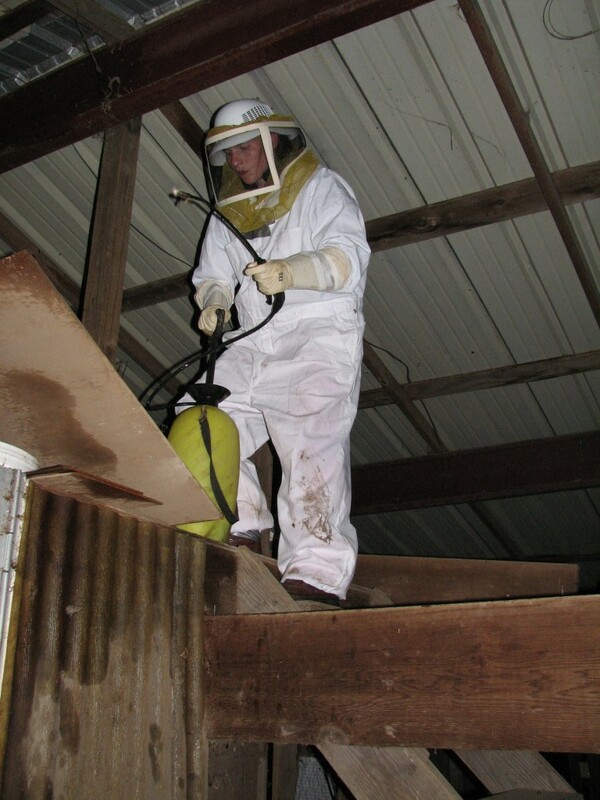 As our trust in the suits built confidence, we opened the hive and moved around with our sprayers for about 30 minutes, killing several hundred. Finally there were only a few flying around and we called it a night. We each only suffered one sting – mine as one found a hole I didn’t know about and crawled up into my mask, stinging my jaw. The other flew out of our clothes after we had stripped off all our protective gear inside and stung Brian on the shoulder. 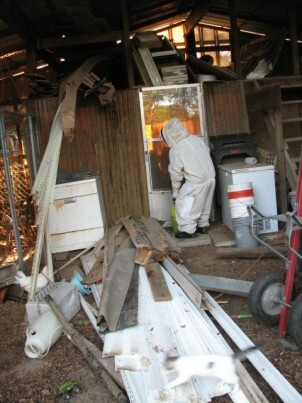 We carefully avoided the barn the next day or two, doing chores under cover of dark. Two mornings later, in the cool of early dawn we suited up again and killed another 30-40 who had regathered near the ruined nesting sight. We pulled the sodden nest out of the loft – at least what was left. 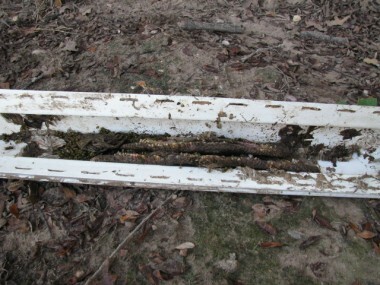 The original nest was about 18 inches long and at least three tiers deep. Stuff pulled from the loft in order to make sure we got everything. Now all that is left is the clean up! 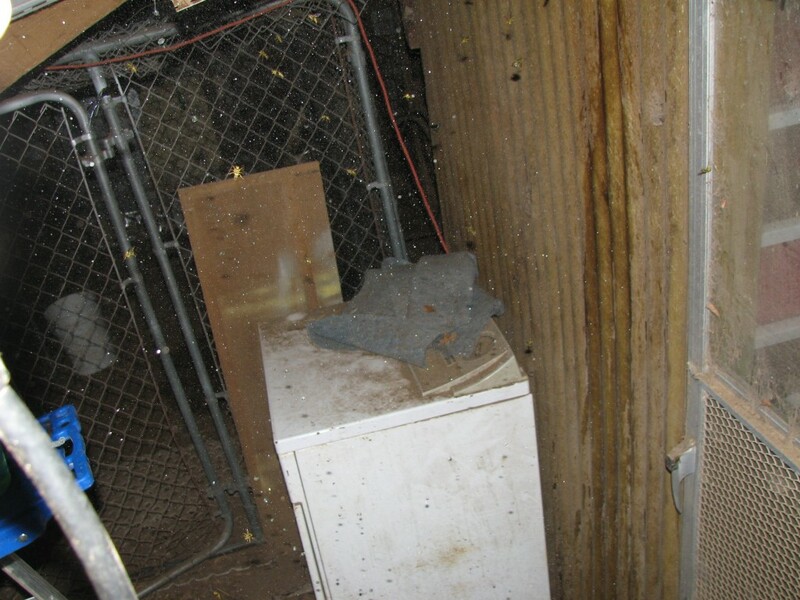 We are especially glad we just used soapy water instead of poison because our chickens helpfully ate every single yellow jacket and the nest! We felt very accomplished in our removal and are much relieved to walk around the barn without the fear of getting stung! Oh my goodness. Praising God for his protection over all of you. Wow! Scary! I despise bees and wasps and all flying/buzzing/stinging insects! Good job on getting rid of them!